Back in the good ol' days, U.S. depository institutions (mostly banks) held just enough cash reserves (deposits they held at the Fed) to meet their settlement needs. At the end of the day, a bank short of reserves could borrow them from a bank with excess reserves. These trades would occur on the so-called federal funds market and the interest rate agreed upon on these (unsecured) overnight loans is called the federal funds rate (FFR). In fact, there was (and is) no such thing as "the" FFR because these trades did not (and do not) occur in a centralized market at a single price. Trades in the FF market occur in decentralized over-the-counter markets, with the terms of trade (interest rates) varying widely across transactions (see figure 12 here). "The" FFR we see reported is sometimes called the effective FFR. 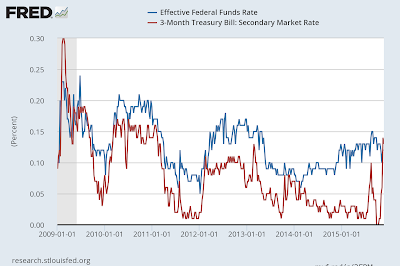 The effective FFR is just a weighted average of reported interest rates negotiated in the federal funds market. 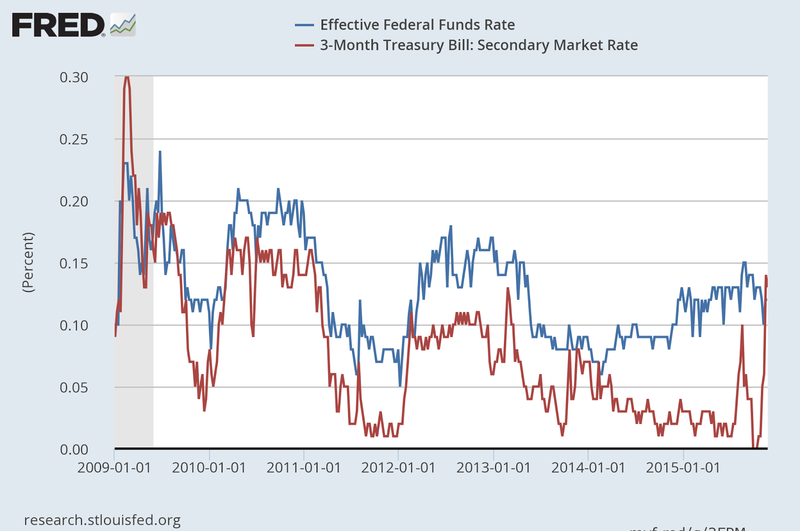 For better or worse, the FFR was (and still remains) the Fed's target interest rate. Prior to 2008, the Fed (actually, the FOMC) would choose a FFR target rate and then instruct the open markets trading desk at the New York Fed to engage in open market operations (purchases and sales of short-term Treasury debt) to hit the target. To raise the FFR, the trading desk would sell bonds, to lower it, they would buy bonds. (Evidently, even the mere "threat" of buying and selling bonds following an FOMC policy rate announcement often seemed sufficient to move the market FFR close to target.) The way this worked was as follows. A sale of bonds would drain reserves from the banking system, compelling banks short of cash in the FFR market to bid up the FFR rate. A purchase of bonds would induce the opposite effect. The system worked because banks were compelled to economize as much as they prudently could on their reserve balances. Prior to 2008, the Fed was legally prohibited from paying interest on reserves (IOR). But the world is now changed. In 2008, the Fed started paying a positive IOR (25 basis points). And it started buying large quantities of U.S. treasury and agency debt. The Fed funded these purchases with interest-bearing reserves. It may seem like a strange thing to do, but from a banker's perspective it looks brilliant. Imagine buying a risk-free asset yielding 2-3% and funding the purchase by borrowing at 1/4%. The profit the Fed makes on this spread is mostly remitted to the U.S. treasury (i.e., the taxpayer). In 2014, the Fed remitted close to $100B. The U.S. banking system is now flush with reserves--most depository institutions (DIs) hold "excess" reserves. (Incidentally, there is no way for the banking system collectively to "get rid" of these excess reserves. In particular, the banking system as a whole cannot "lend out reserves.") And since most DIs have excess reserves, the FFR market is essentially dead. Well, not quite dead. There are still a few trades, motivated primarily by the fact that some key participants in the FF market (GSEs) are legally prohibited from earning IOR. The Federal Home Loan Banks, in particular, have a large supply of funds that, if they could, would happily hold these deposits at the Fed earning 25bp. Instead, they must hold these funds with DIs, who are able to earn IOR (see here). Because short-term treasury debt is yielding close to zero, the effective FFR negotiated between DIs and non-DIs lies somewhere between zero and IOR (see following graph). According to Afonso and Lagos (2014), the volume of trade in the FF market has dropped to about $40B per day from its peak of $150B per day prior to 2008 (see their figure 4). Alright, so where are we at? Since 2008, the Fed has congressional authority to pay IOR (to DIs only). The Fed can clearly set IOR where ever it wants (within limits). So when lift off date arrives, raising IOR by (say) 25bp will pose no problem from an operational viewpoint. The Fed, however, has elected to keep the FFR--not the IOR--as "the" policy rate. Given this choice, there is the question of how the Fed expects to influence the FFR when there is no (or very little) FF market left in this world of excess reserves. Theoretically, IOR should serve as a floor for the FFR. But evidently there are "balance sheet costs" and other frictions that prevent arbitrage from working its magic. So the problem (for the Fed) is how to guarantee that its policy rate--the FFR--will lift off along with an increase in IOR. Enter the Fed's new policy tool -- the overnight reverse repo (ON RRP) facility, overseen by Simon Potter of the NY Fed. Actually, the tool is not exactly new. 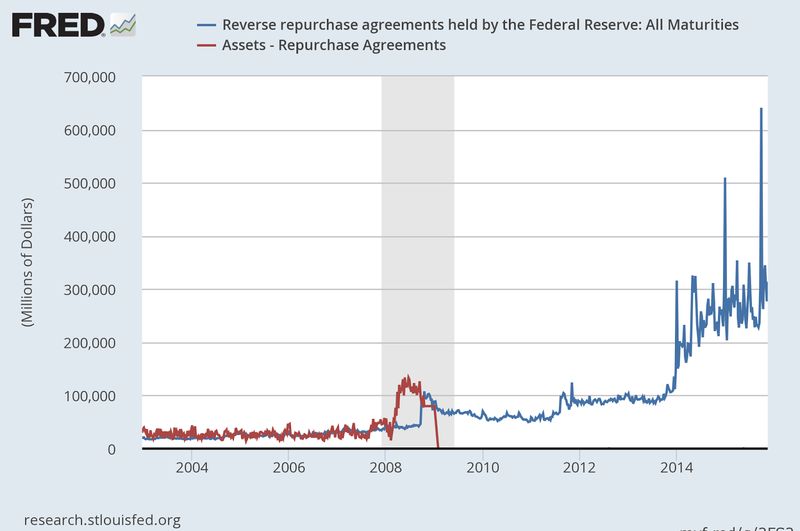 The Fed has historically used repos and reverse repos for a long time; see the following graph. In a repo exchange, the Fed buys (borrows) a security from a DI in exchange for reserves. In this case, the DI is borrowing reserves from the Fed. The value of the Fed's repo holdings is plotted in red above. Since the advent of QE, the repo facility has remained dormant. 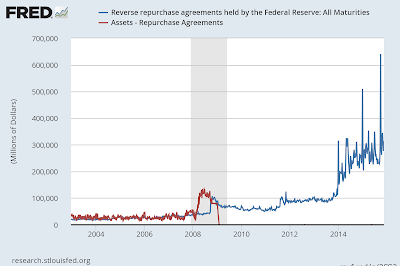 In a reverse repo, the Fed sells (lends) a security to a DI in exchange for reserves. In this case, the DI is lending reserves to the Fed--that is, reverse repo is just a way for the Fed to pay interest on reserves. The blue line above plots the value of reverse repo holdings. What's new about the ON RRP facility is that it is open to an expanded set of counterparties (beyond the regular set of DIs). The NY Fed publishes a list of these counterparties here. It is notable that GSEs and MMMFs are including in this list. Lift-off (an announced increase in the FFR target rate or band) will then be accompanied by an increase in the IOR to (say) 50bp together with an ON RRP rate of (say) 25bp. The hope is for the effective FFR to trade somewhere within this interest rate band. Theoretically, the ON RRP rate should provide an effective floor for the FFR--assuming that the facility is conducted on a full allotment basis (i.e., assuming that the facility is not capped in some manner). If the facility is capped, and if the cap binds, then we may observe trades in the FF market occurring at rates lower than the ON RRP rate. This latter scenario is obviously one that the Fed would like to avoid. There is also the question of whether other market interest rates will follow the FFR upward in the present environment. Some economists, like Manmohan Singh of the IMF worry that the Fed is using the wrong tool for lift off (see his piece in the Financial Times here). Singh would prefer outright asset sales because the treasuries released in the market can then be left to circulate (via re-use and rehypothecation) to relieve an ongoing asset shortage. (The securities released by the Fed in its ON RRP facility are evidently not expected to circulate.) It is conceivable, though perhaps unlikely, that the yield on short-term treasuries remains close to zero (reflecting a stubborn liquidity premium) even as the FFR is increased. As always, it will be interesting to see what actually transpires. Economic exchange depends critically on secure and trustworthy payment systems. Because payment systems are fundamentally about recording and communicating information, it should come as no surprise that payment systems have evolved in tandem with advancements in electronic data storage and communications. One exciting development of late is Bitcoin--an algorithmic-based, communally-operated money and payment system. I thought I'd take some time to gather my thoughts on Bitcoin and to ponder how central banks might respond to this innovation. Bitcoin is about as close as we have come to digital cash. And because the bitcoin is in relatively fixed supply (or so we think), people sometimes refer to Bitcoin as managing a digital-gold system. Let's think about cash for a minute. Cash is a bearer instrument (ownership is equated with possession). Cash payments are made in a P2P manner, without the aid of an intermediary. When I buy my morning coffee, I debit my wallet of cash and the merchant credits her register by the same amount. There is a finality to the transaction (unless my coffee is cold and the merchant values my future business). To the extent that cash is difficult to counterfeit, it solves the double-spend problem. The use of a cash-based payment system is "permissionless" (no application process is needed to open a cash wallet, no personal information needs to be relinquished to open an account). Relatedly, cash is "censorship-resistant," meaning that you can basically spend it as you see fit. Finally, cash is distributed on an invisible ledger, permitting a degree of anonymity. Cash transactions need not leave a paper trail. 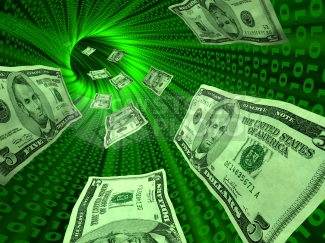 The digital money issued by banks is different from cash in several respects. One main difference is that transactions between any two traders must be intermediated by a bank. Transactors implicitly trust the bank to do the proper book-keeping and it is this trust that "solves" the double-spend problem for digital bank money. Bank money is not permissionless. One has to make an application for a bank account and, in the process, relinquish a great deal of personal information that one trusts the bank to keep secure. People who are unable to properly identity themselves are denied conventional banking services (up to 1/4 of American households are estimated to be unbanked or underbanked). Bank money is not censorship resistant--banks may not process certain types of payment requests on your behalf. Of course, bank money leaves a digital trail (albeit on a system of closed ledgers) with your identity clearly attached to a particular transaction history. So what are the benefits of Bitcoin? The benefits are likely to vary from person to person, but in general, I'd say the following. First, it's monetary policy reduces the "hot potato" motive of economizing on money balances--that is, it offers the prospect of being a decent long-run store of value. Second, anyone with access to the internet can access an account (a public/private key pair) for free--like cash, no permission is needed. The public key is like an account number and the private key is like a password. Account balances remain secure as long as the private key remains secure. Third, like cash, no personal information is necessary to open an account, so no need to worry about securing private information. Fourth, like cash, bitcoin is censorship resistant--no one can prevent you from spending/receiving bitcoin from whomever you like. Fifth, bitcoin can offer a greater degree of anonymity than bank deposit money, but less so than cash (unlike cash, the blockchain ledger is visible and public). Sixth, the entire money supply (blockchain) lives on a replicated distributed ledger--it lives simultaneously everywhere--so that "sending money somewhere" means updating the ledger on all computers everywhere. There are no banks, there are no borders. Seventh, the user cost of transferring value is relatively low. As I said, the extent to which consumers value these benefits likely depends on a host of factors. I see potentially large benefits to relatively poor individuals who have limited access to conventional banking services. It is estimated that up to one in four U.S. households are unbanked or underbanked--people who must rely on high-cost bill-pay, prepaid debit cards, check cashing services, and payday loans. The benefits are likely to be greater for poor individuals living in high inflation regimes that do not have access to interest-bearing (inflation protected) accounts. How might the advent of Bitcoin influence central bank thinking? First, the threat of Bitcoin (and of currency substitutes in general) places constraints on monetary policy. In jurisdictions that finance large amounts government spending through the inflation tax, such a constraint may become binding. Second, to the extent that bitcoin becomes a significant payment instrument (or even the unit of account), it might open the door to financial instability. Experience demonstrates the private sector's desire for maturity transformation or, more generally, the willingness to act on incentives that make funding illiquid assets with short-term debt a preferred balance sheet structure. The same incentives would presumably be in place in a Bitcoin economy. In principle, demand-like liabilities should trade at a risk premium. But in practice, they may not. Especially in times of economic complacency, they are likely to be viewed as close to perfect substitutes in terms of their money properties, just like bank money and cash today (and the way U.S. treasury debt and senior tranches of private-label MBS were viewed as close collateral substitutes in the repo market prior to 2008). The question is what happens if and when there is a "bank-run" or "roll-over crisis" on such a system? The situation is exacerbated if bitcoin is not the unit of account (think of European banks issuing loans denominated in USD). Since federal deposit insurance may not be available and since no LOLR can issue BTC, a classic bank panic is possible. Central banks and fiscal authorities would have to think about what, if anything, to do in such circumstances. One solution may be to impose narrow banking restrictions for banks (and other entities) engaged in bitcoin-denominated maturity transformation. My own recommendation is for central banks to consider offering digital money services (possibly even a cryptocurrency) at the retail and wholesale level. There is no reason why, in principle, a central bank could not offer online accounts, the same way the U.S. Treasury presently does (www.treasurydirect.gov). These accounts would obviously not have to be insured. They would provide firms with a safe place to manage their cash without resorting to the banking or shadow banking sector. They would give monetary policy an additional instrument--the ability to pay interest on low-denomination money (possibly at a negative rate). To the extent paper money is displaced, there would be large cost savings as well. It's hard (for me) to see what the downsides are in having a central bank supply digital money. Critics might argue that it leaves people exposed to potentially poor monetary policy. This may be true and, for these people, currency substitutes should be available (including Bitcoin). In terms of payments, critics might argue that central bank accounts will be permissioned accounts, requiring the release of personal information, application efforts, that KYC restrictions will apply (so not censorship resistant) and so on. To address these concerns, a central bank could go one step further and issue a cryptocurrency (Fedcoin) offered at a fixed exchange rate where payments are cleared using a Bitcoin-inspired anonymous communal consensus algorithm. I don't think we can expect anything like this in the near future, but it is technologically possible. Of course, people will complain that Fedcoin will inspire illicit trade, etc. But again, the same is true of regular central bank issued cash. There is the question of how such an innovation might impact traditional banking models. I'll leave this question for another post. where R is the nominal interest rate, r is the real interest rate, and E[p] is the expected rate of inflation. If bond buyers expect inflation to increase then they'll ask for more compensation in the form of a higher nominal interest rate (a lower bond price). 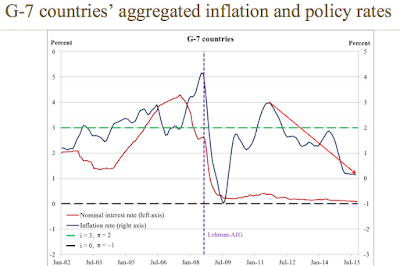 The conventional idea is that monetary and fiscal policies (in particular, the expectation of how these policies will unfold over time) largely determined inflation expectations E[p]. 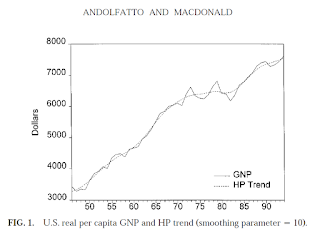 In conventional (modern) macro economic theories, expectations are assumed to be formed "rationally" (i.e., in a manner that is consistent with the stochastic processes that actually govern the economy). Neo-Fisherians reverse this conventional direction of causality. They argue that increasing R leads people to revise their inflation expectations upward. And because people have rational expectations, for these expectations to be consistent with reality, actual inflation will (somehow) have to increase. As far as I can tell, this Neo-Fisherian proposition comes in two stripes. The first stripe is of the "cashless economy with Ricardian equivalence" variety--the models that Michael Woodford likes to use. In this class of models, "balance sheets don't matter." And because central bank money and government bonds are just ways of labeling the liabilities of the consolidated government sector, they don't matter for determining (among other things) the price-level. In this class of models, inflation expectations are somehow assumed to adjust to satisfy the Fisher equation. And then the price-setting behavior of firms (who set prices in an abstract unit of account but do not actually accept payment in any monetary object) adjusts in a manner that is consistent with higher expected inflations. Personally, I find this view implausible. Moreover, it's frustrating that no one promoting this view seems willing or able to explain how/why all this is supposed to happen (beyond repeating the phrase "the Fisher equation must hold" or "it's a rational expectations equilibrium"). The second stripe of this proposition, however, seems more plausible (at least, in principle) to me. In this world, balance sheets matter. The supply and composition of the government's assets and liabilities matter. And in particular, the time-path of the total nominal government debt (and its composition) matters for determining the price-level. The idea here is that when the central bank announces a higher R, there is a corresponding passive accommodation of central bank policy on the part of the fiscal policy to increase the rate of growth of total government debt (i.e., cut taxes, or engage in "helicopter drops"). If the fiscal authority behaves "passively" in this sense, then people will rationally expect higher inflation--and the higher inflation will actually transpire not because people expected it, but because the fiscal authority delivered it. I think this is an interpretation that even Nick Rowe agrees with (see here). Both versions of the Neo-Fisherian proposition above seem to rely heavily on the notion of rational expectations. In my previous post, I speculated that the proposition might hold even if people had non-rational "adaptive" expectations. The idea I had there was that if a sudden increase in R caused to the price-level to jump up (instead of down, which is the usual presumption), then people with adaptive expectations will revise their inflation expectations upward (not downward). An initial increase in the price-level might happen if, for example, the higher interest rate led to higher operating expenditures on the part of firms. 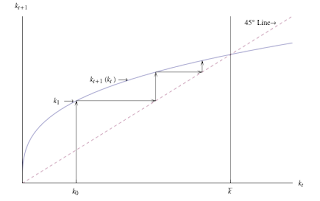 Following this initial impulse, the actual path of inflation would be determined either by (stripe 1) the nature of learning dynamics or (stripe 2) the manner in which policy accommodates itself to the price shock (e.g., see Christiano and Gust, 1999). In response to my post, Erzo Luttmer alerted me to his paper Fisher without Euler, in which he claims that the Neo-Fisherian proposition pops out of a model in which people are not forward-looking at all. The argument, as far as I can tell, relies heavily on how the government debt-service cost is financed. Let me try to explain (you can refer to Erzo's paper and short note to see whether I have it right). To close the model, we need a theory of the price-level. The simplest theory I can think of is the Quantity Theory: p(t) = B(t-1)/y(t), where y(t) is real income (and velocity is held constant), so that B(t-1)/p(t) = y(t). 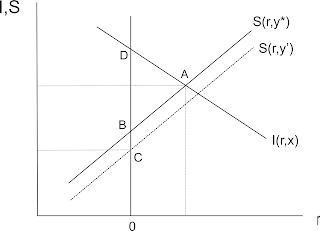 If we treat y(t) as exogenous, then it follows immediately that lowering the interest rate (increasing q) necessitates a decline in inflation (μ). So lowering the interest rate lowers the debt-service cost of debt which (for given real spending and taxation levels) means that the supply of nominal debt need not grow as quickly -- as the growth rate in the supply of "money" declines, so does inflation. The Neo-Fisherian result follows even without forward-looking behavior. Erzo then combines these latter two equations to determine the price-level p(t), treating y(t) and g(t) as exogenous (as did I). At the end of the day, it's a simple point. Still, I think it's an important one to keep in mind since I am reading in more than one place that the Neo-Fisherian proposition depends on rational expectations. Evidently, it does not. In an earlier post, I summarized the main arguments people have used for and against a September lift-off. There are, of course, other arguments one can make and bond guru Bill Gross isn't shy about offering his view on the matter in his September 23 2015 investment outlook. According to Gross, the Fed's low interest rate policy constitutes a form of "financial repression." His argument, as far as I can tell, goes as follows. Long-term prosperity depends on the stock of productive capital. The stock of productive capital is augmented by investment (the flow of newly produced capital goods). Investment is financed out of saving. Low interest rates discourage saving. Therefore, low interest rates are ultimately a prescription for secular stagnation. Gross claims that "no model will lead to this conclusion." I'm not exactly sure what he means by that. I think what he means "forget about theory, let's just look at the facts." Unfortunately, facts do not always speak for themselves. So what sort of evidence does he select to support his conclusion? 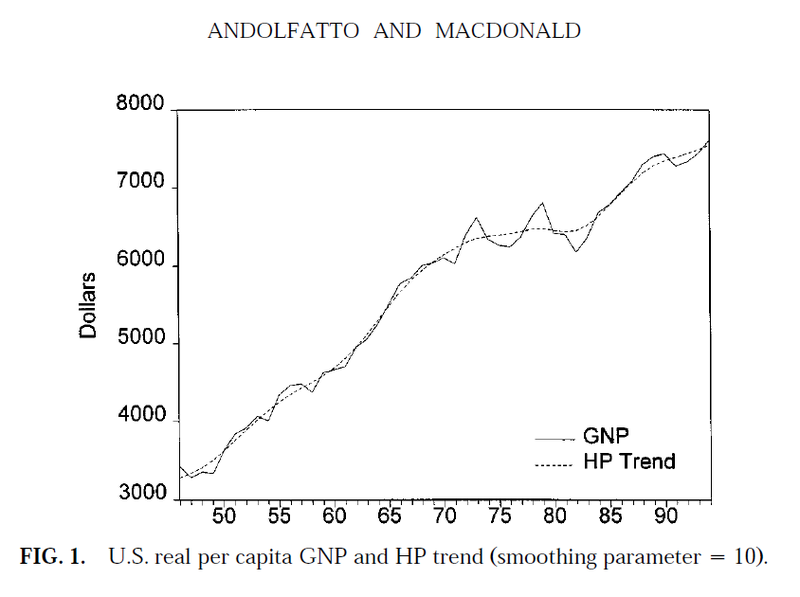 He begins by noting that inflation-adjusted interest rates (on high-grade bond instruments, I presume) were on average negative over the period 1930-1979 and on average positive since then (thanks to Volcker) until recently. Here's what the data looks like since the end of the Korean war (FRED only gives me the interest rate series since then). 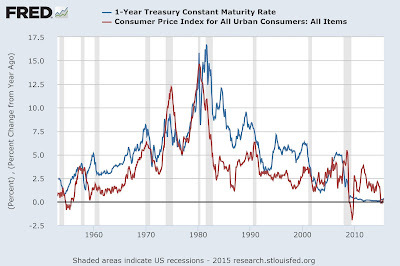 The blue line plots the nominal yield on a one-year treasury, the red line plots the one-year CPI inflation rate. Blue minus red gives us a measure of the realized inflation-adjusted return on a nominally risk-free security. Returns were relatively high in the 1960s, 1980s, 1990s, and relatively low in the 1970s, 2000s, and 2010s (so far). But then Paul Volcker turned the bond market upside down and ever since (until 2009), financial markets enjoyed positive real yields and a kick in the pants boost to other asset prices, as those yields gradually came down and increased the present value of bonds, stocks and real estate. This is a bizarre statement in some respects. First, as the data above makes clear, it was nominal yields that gradually came down--real yields remained elevated for two decades after the event. Second, he evidently does have a model of how a policy-induced increase in the nominal interest rate leads to prosperity: as yields march downward from an elevated level, capital gains are realized in a broad range of asset classes. This is a bizarre argument both in its own right and because it ignores the initial capital losses realized on wealth portfolios when the policy rate is suddenly increased. So, no, I don't think that model makes much sense. But if so, then how do we make sense of the data? 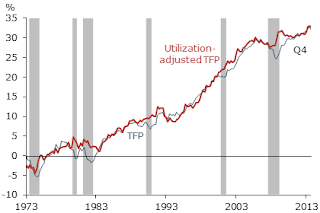 The fact is that the U.S. economy generally did prosper after the 1981-82 recession. Most economists attribute this subsequent era of prosperity in part to the fact that Volcker's policies ushered in an era of low and stable inflation. Jacking up the interest rate was just a temporary measure to bring inflation down. And once inflation began to drift down, nominal yields declined because of the Fisher effect. The fact that real yields remained elevated was just the by-product of an accelerated growth in productivity (after the 1970s productivity slowdown) that likely had little to do with monetary policy. But maybe this conventional interpretation is incorrect. Could Gross be on to something? Maybe there is a model that justifies his conclusion. I've been thinking about this lately, wondering just what such a model would look like. Here is what I came up with. 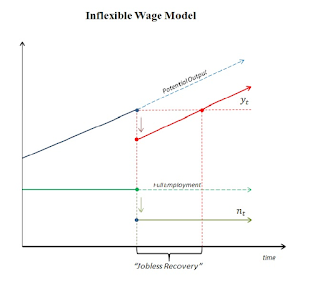 Consider a textbook macro model. 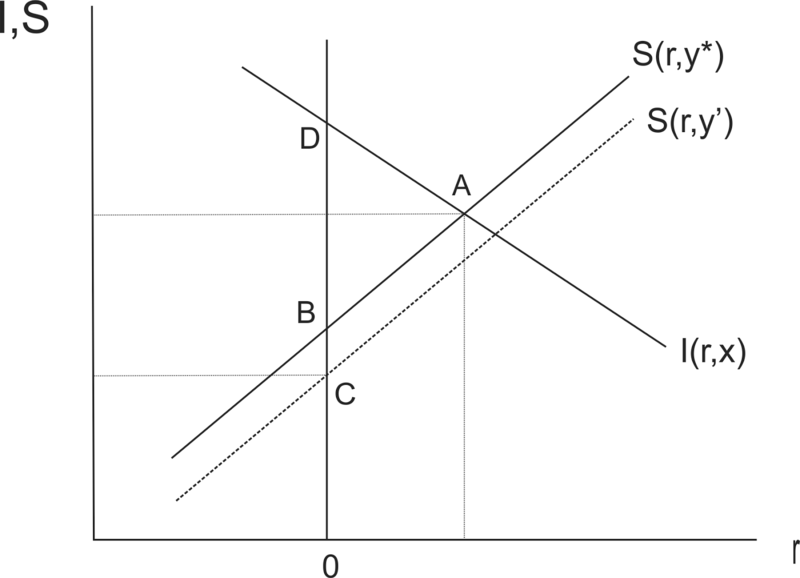 Let S(r,y) denote the supply of saving, assumed to be increasing in real income y (GDP) and the real interest rate r. Let I(r,x) denote the demand for investment, assumed to decreasing in the real interest rate r and increasing in the expected productivity of capital investment, x. 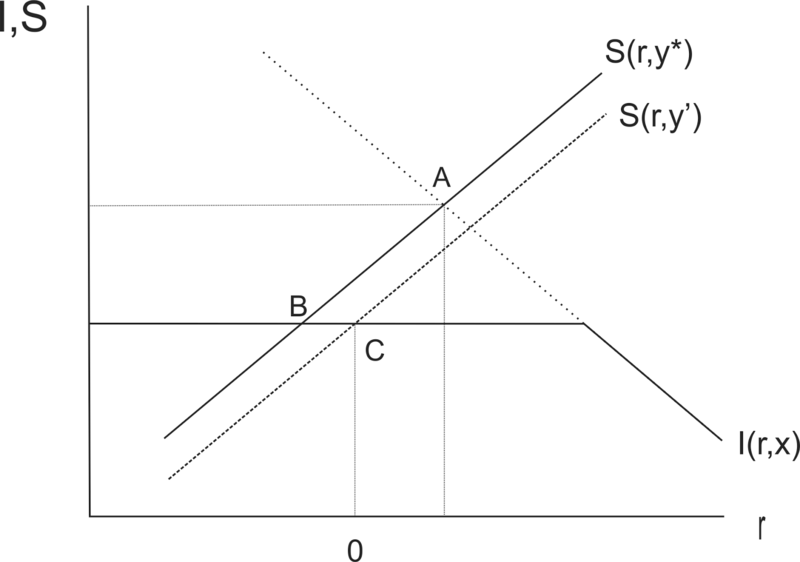 In a closed economy, domestic saving must equal domestic investment, so S(r,y) = I(r,x). This equation gives us the famous IS curve: the locus of (y,r) combinations consistent with S=I. This relation exists, in one form or another, in virtually every macro model I'm aware of. The neoclassical view is that the market, left to its own devices, will determine a "full employment" level of income, y*. With y* so determined, the equilibrium rate of interest r* is determined by market-clearing in the loanable fund market, S(r*,y*) = I(r*,x). 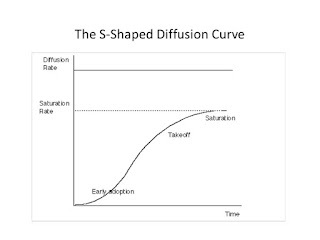 Business cycles are generated by fluctuations in the x. High x is associated with optimism, low x with pessimism (over the expected return to capital spending). The diagram below demonstrates what happens when the economy switches from an optimistic outlook to a pessimistic outlook. 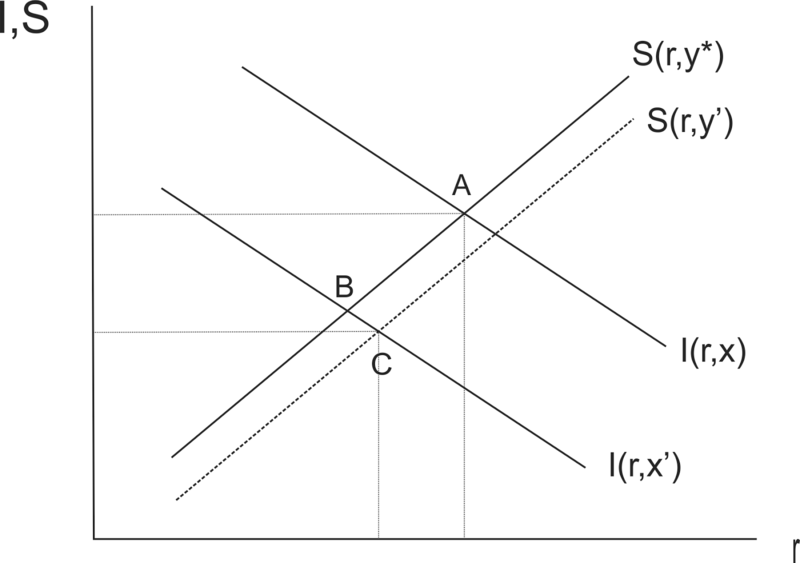 Let point A denote the initial equilibrium position. A decline in x to x' shifts the investment demand schedule downward. Lower investment demand puts downward pressure on the interest rate--the economy moves along the saving schedule from point A to B. If depressed expectations persist, then the lower level of investment leads to a lower stock of productive capital. This has the effect of depressing GDP. As income declines from y* to y', the saving schedule shifts down and the economy moves from point B to C.
Point C is characterized by lower income, lower investment, lower saving and a lower real interest rate. 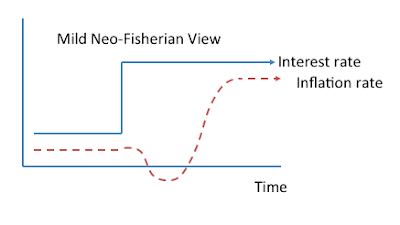 This is the neoclassical explanation for why periods of why real interest rates are procyclical. 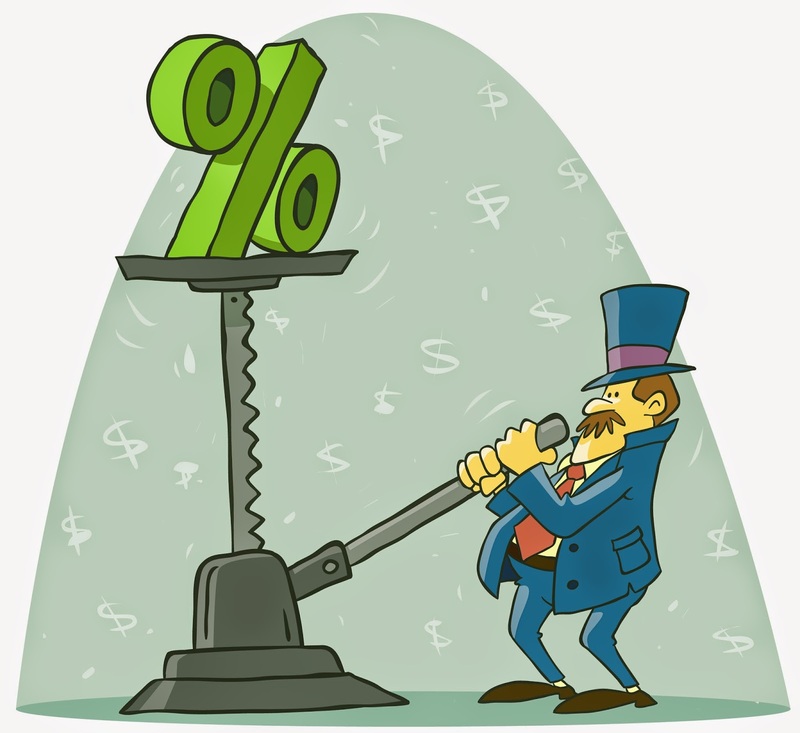 Low interest rates are not the product of "financial repression." They are symptomatic of a depressed economic outlook. And any attempt to artificially increase the real interest rate is going to make things worse, not better. One cannot legislate prosperity by increasing the interest rate. Now, if I understand Gross correctly, he seems to be saying that present circumstances are not the byproduct of depressed expectations. The problem is that the Fed is keeping the real interest rate artificially low. Let's try to interpret this view in terms of the following diagram. The economy naturally wants to be at point A, where the interest rate is higher, along with saving, investment and income. 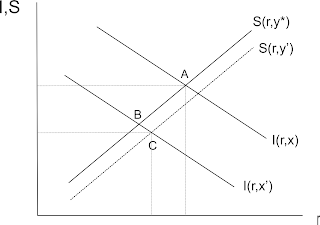 But the Fed is keeping the interest rate artificially low--at zero, in the diagram below. The effect of the zero interest rate policy is to discourage saving. While the demand for investment is high (point D), there's not enough saving to finance it (point B). As such, the level of investment falls from A to B. 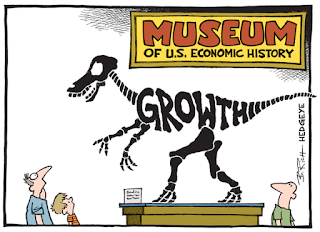 The lower investment eventually translates into lower GDP. As income declines, the saving schedule shifts down and the economy eventually settles at point C. This is secular stagnation brought about by the Fed's financial repression. How so? Because zero bound interest rates destroy the savings function of capitalism, which is a necessary and in fact synchronous component of investment. Why that is true is not immediately apparent. If companies can borrow close to zero, why wouldn’t they invest the proceeds in the real economy? The evidence of recent years is that they have not. Indeed, the logic of the argument is not apparent at all. With interest rates so low, the business sector should be screaming for funds to finance huge new capital expenditures (point D in the diagram above). But they are not. Why not? At this stage, he simply abandons the logic and refers to the evidence. As if the evidence alone somehow supports his illogical argument. There are, in fact, some logical arguments that one can use to interpret the facts. One is given by the neoclassical interpretation in the first diagram above. Expectations are depressed because the investment climate is poor (feel free to make a list of reasons for why this is the case). The demand for investment is low. Low investment demand is keeping the real interest rate low. The Fed is just delivering what the market "wants" in present circumstances. Raising the interest rate in the present climate would be counterproductive. There is another argument one could make. Suppose that the investment climate is not depressed. There are loads of positive NPV projects out there just waiting to be financed. Unfortunately, financial conditions are such that many firms find it difficult to find low-cost financing to fund potentially profitable investment projects. In the wake of the financial crisis, creditors still do not fully trust debtors to make good on their promises. As well, regulatory reforms like the Dodd-Frank Act may make it more difficult to supply credit to worthy ventures. In the lingo used by macroeconomists, firms may be debt-constrained. The situation here is depicted in the following diagram. If the analysis above is correct, then the recommendation to increase interest rates in the present climate is off base. Low interest rates are not the cause of our ills--they are symptomatic of deeper problems. The way to get interest rates higher is to adopt policies that would stimulate investment demand (the neoclassical view) and/or adopt measures that would remove financial market frictions (the debt-constraint view). A deficit-financed tax cut (or subsidy) on investment spending would constitute one such measure. There are, of course, other models that one could use to justify a policy-induced increase in the interest rate in present circumstances. Some members of the FOMC, for example, view the economy as having largely recovered and are now worried about the effect of very low interest rates on the prospect of future inflation. These types of arguments, however, are quite a bit different from the Gross hypothesis. But if he wants higher interest rates, maybe he should use them! A bit of a warning though: I don't think his bond portfolio is going to like the consequences. The statement from the July meeting of the Federal Open Market Committee reveals a support for starting to increase interest rates this Fall, provided some further improvement in the labor market. Such monetary policy stance is currently held also by policy makers in the U.K., as hinted by some members of the Monetary Policy Committee, the rate-setting body of the Bank of England. An important channel through which interest rates affect the typical household is the cost of servicing mortgage debt. Standard mortgage loans require homeowners to make nominal installments—regular interest and amortization payments—calculated so that the loan is fully repaid by the end of its term. Changes in the interest rate set by the central bank affect the size of these payments, but differently for different types of mortgage loans. In addition, the real value of these payments depends on inflation. Fixed-rate mortgages (FRM), characteristic for the U.S., have a fixed nominal interest rate and thus constant nominal installments for the entire term of the loan, typically 15 or 30 years. The FRM interest rate is determined at origination on the basis of the mortgage lenders’ expectations of the future path of the central bank interest rate. In contrast, the interest rate of adjustable-rate mortgages (ARM), a standard contract in the U.K., changes every time the central bank interest rate changes. The nominal installments of ARM loans are thus recalculated on every such occasion, to ensure the full repayment of the loan by the end of its term. While mortgage contracts specify nominal installments, either fixed of adjustable, the real cost of servicing mortgage debt depends on inflation. The effects of the liftoff on homeowners will therefore depend not only on the mortgage type and the future path of interest rates but also on what happens to inflation during the liftoff. It is instructive to illustrate the effects of the liftoff on homeowners in terms of changes in mortgage debt servicing costs (DSC)—nominal mortgage payments deflated by inflation as a fraction of household real income. This variable provides a metric of the burden of mortgage debt to homeowners as it measures the fraction of real income homeowners have to give up to meet the mortgage payment obligations of their contract. The numerical examples below illustrate these points. Figure 1 considers two alternative paths of the central bank interest rate, a slow liftoff and a fast liftoff from the current nearly zero lower bound (ZLB). In both cases, the interest rate is assumed to revert to 4 percent, the pre-2007 crisis average. In the fast liftoff case, it reaches the half-way mark of 2 percent in two years’ time, whereas in the slow liftoff case this mark is not reached until about eight years from the start of the liftoff. 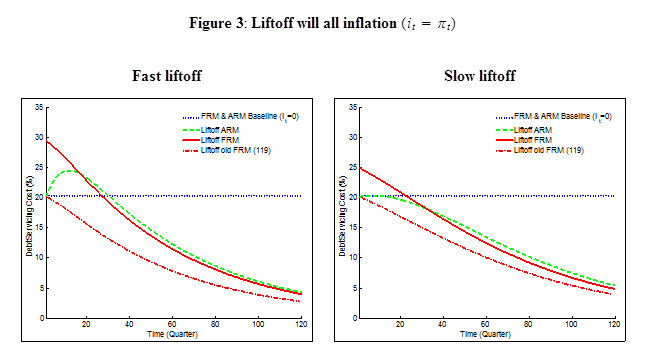 Figure 2 plots DSC in the case of liftoff that is not accompanied by an increase in inflation. 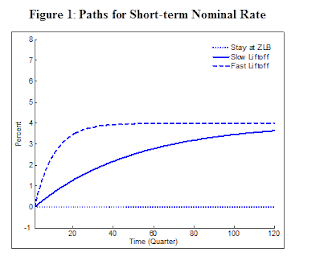 In this case the path of the nominal interest rate in Figure 1 coincides with the path of the real interest rate. 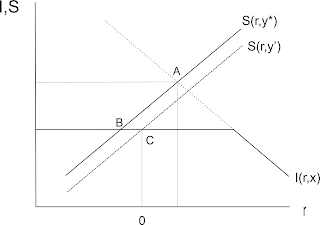 Figure 3 contrasts this case with a situation where the increase in the central bank interest rate is accompanied by a one-for-one increase in the inflation rate. 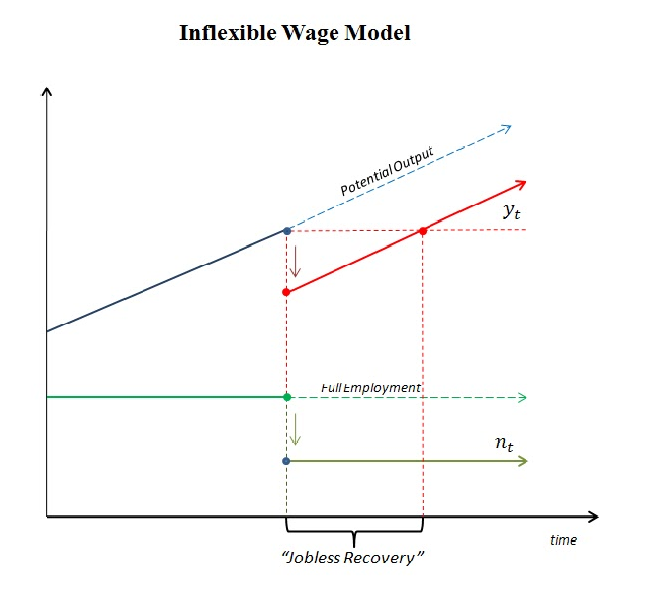 In this case, the real rate is left unchanged at zero percent and the path of the nominal interest rate in Figure 1 is equivalent to a path of the inflation rate. 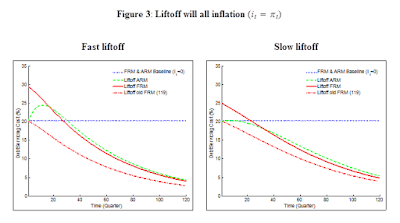 While both assumptions are extreme, they demonstrate how the effects of the liftoff depend on the inflation rate. 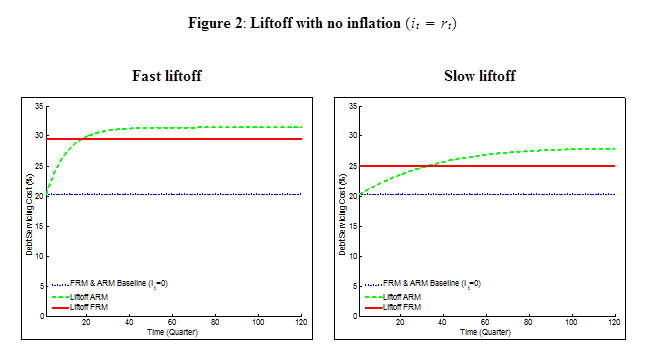 In both figures, the DSC under the various liftoff scenarios are compared with a baseline case, in which both the central bank interest rate and the inflation rate stay unchanged at zero percent (blue dotted line), approximately the current situation. In this case, DSC are about 20 percent due to the assumed lenders’ markup of three percentage points. When inflation stays at zero percent during the liftoff (Figure 2) the real mortgage payments of existing homeowners with FRM loans are unaffected. This is because the FRM interest rate has been fixed at origination before the liftoff and inflation stays at zero percent. However, new FRM loans will be priced according to the expected path of the central bank interest rate in Figure 1 and will therefore carry a higher interest rate. The new FRM interest rate is higher the faster is the liftoff. In the case of the fast liftoff, the higher interest rate implies DSC of almost 30 percent; under the slow liftoff, DSC will be 25 percent (the solid red lines in Figure 2). When mortgages are ARM, the liftoff affects both, existing and new homeowners. The dashed green lines plot DSC for new ARM homeowners and essentially track the paths of the central bank interest rate—DSC gradually increase from 20 percent to 32 percent under the fast liftoff and to 27.5 percent under the slow liftoff. For existing homeowners with ARM the effects depend on when the loan was originated. The more recently originated was the loan the more will the path of DSC resemble that for new loans. DSC of loans that are almost repaid will be almost immune to the liftoff. This is not only because the debt outstanding gets smaller over the life of the loan, but also because mortgage payments in later periods of the life of the loan are mostly amortization payments, rather than interest payments. 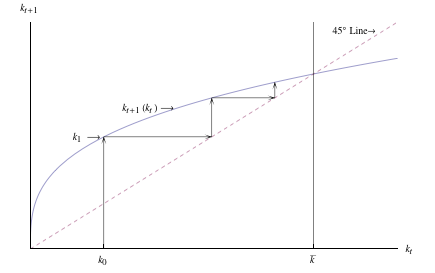 When the liftoff is accompanied by equivalent increase in inflation, and no change in the real rate, the impact of the liftoff on DSC is greatly attenuated (Figure 3). First, existing FRM homeowners gain from the higher inflation and these gains grow over time as persistent inflation deflates the real value of the nominal payments, which under FRM are constant. Those with the more recently originated mortgages gain the most over their homeownership tenure (the dash-dotted red lines in the figure show the case of a mortgage with 119 quarters remaining; that is 29 years and 3 quarters). New FRM borrowers, however, will face a higher mortgage rate and, as a result, initial DSC of almost 30 percent in the fast liftoff case (solid red line). But the real value of those payments will also gradually decline over time. For ARM homeowners, both the existing and new homeowners, there are two opposing forces in place. On one hand, higher nominal interest rates increase nominal mortgage payments. On the other hand, higher inflation reduces their real value. The first effect is stronger initially but the second effect dominates over time. Furthermore, the point where the second effect starts to bite depends on the speed of the liftoff. While in the fast liftoff case the first effect dominates for the first eight years (32 quarters), in the slow liftoff case it hardly bites at all (dashed green lines). To sum up, the effects of the liftoff on homeowners depend on three factors: (i) the prevalent mortgage type in an economy (FRM vs ARM), (ii) the speed of the liftoff, and (iii) what happens to inflation during the course of the liftoff. If inflation stays constant at near zero then in the U.S., where FRM loans dominate, the liftoff will affect only new homeowners. In the U.K., where ARM loans dominate, the negative effects will in contrast be felt strongly by both new and existing homeowners. However, if the liftoff is accompanied by sufficiently high inflation as in our examples, the negative effects will be much weaker in both countries. In the U.S., the initial negative effect on new homeowners will be compensated by positive effects on existing homeowners. And in the U.K., provided the liftoff is sufficiently gradual, neither existing nor new homeowners may face significantly higher real costs of servicing their mortgage debt. 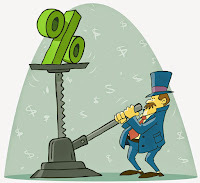 Therefore, if the purpose of the liftoff is to “normalize” nominal interest rates without derailing the recovery, central bankers in both countries should wait until the economies convincingly show signs of inflation taking off. Furthermore, the liftoff should be gradual and in line with inflation. In the U.K., the typical mortgage is the so-called standard-variable rate mortgage, which has an interest rate fixed for the first year or two. After this initial period, the interest rate can vary at the discretion of the lender, but usually the resets coincide with changes in the Bank Rate, the Bank of England policy interest rate. A “tracker” mortgage is explicitly linked to the Bank Rate. Here we abstract from these details. The examples assume that a homeowner’s real income does not change throughout the life of the loan, the loan at origination is four times the homeowner’s income, and mortgage lenders’ mark-up over market interest rates is three percentage points.r market interest rates is three percentage points. 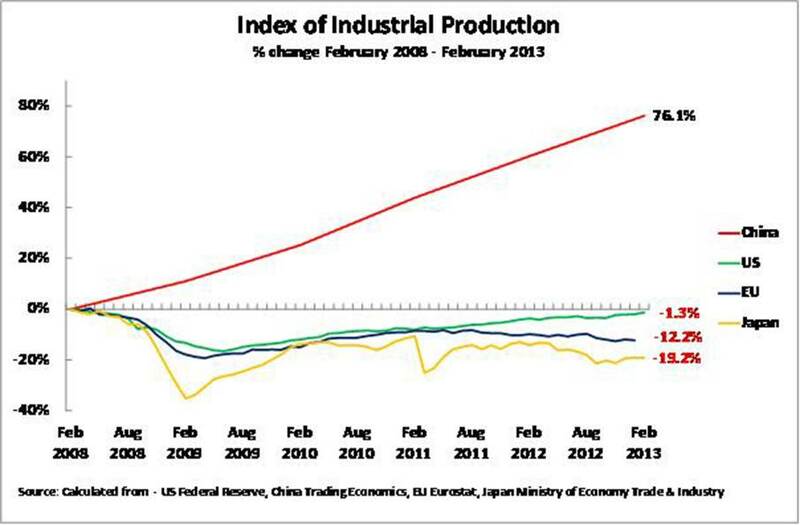 There are several issues involved here regarding China’s economic performance and the effects of its stimulus packages. 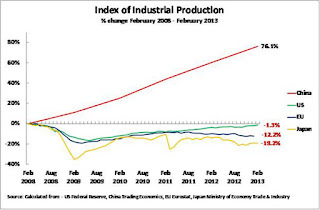 1) As the following graph shows, 5 years after the financial crisis, U.S. industrial production remained 1.3 percent below its peak level; Industrial output in the EU remains at 12.2 percent below its level five years ago; Japan’s industrial production remains at 19.2 percent, below its level; China’s industrial output is 76.1 percent above the level five years previously. Recall that these regions were and are still china’s largest trading partners and China’s total exports have declined permanently by more than 40% since the crisis and still not recovered. China’s industrial production therefore increased by over three quarters during a period when U.S. industrial production stagnated and EU and Japanese industrial production significantly declined. That is a conclusive success for China in this competitive struggle. 2) China’s stimulus package was designed to spend mainly on infrastructure buildup during a period when the costs of investment financing (borrowing) were the lowest. Since the operation of China’s first high-speed railroad merely six years ago, 28 Chinese provinces are now already covered by the world largest and longest high-speed rail network (more than ten thousand miles, greater than 50% of existing world capacity). If China had waited instead for 10 more years to do this, the costs would be many, many times higher. 3) Those being said, China today indeed faces the problem of excess industrial capacity, similar to US and European nations and Japan before WWI. China’s strategy to solve this excess capacity problem is to build a global infrastructure system (through so called “one belt, one road” program) that integrates the entire Eurasia continent and the Indian and Atlantic oceans transports, e.g., a full-fledged speed-train network stretching all the way south to Singapore and north to Russia and east to Europe is already under construction. This program is now backed by the newly established Asian Infrastructure Investment Bank (AIIB). This may look foolish to economists (remember China build the Great Wall for nothing J, not even shown up in GDP) but at least it will benefit global trade with significance no smaller than the Great Voyage. The age of maritime global trade (kick started by the Great Voyage) is perhaps going to be replaced or enhanced by cross continent land trade (a revision to the ancient Eurasian trade through the Silk Road). To sum up, the Chinese appear to be more optimistic than the westerners, especially the well-trained economists, after 300 years of rejecting Capitalism (see my Working paper and forthcoming book: https://research.stlouisfed.org/wp/more/2015-006. History will tell if they are right or not. Should the Fed raise its policy rate this September or not? Seems like a lot of people want to know. For those not following the discussion closely, let me try to summarize what I think are the main arguments for and against a September rate increase. 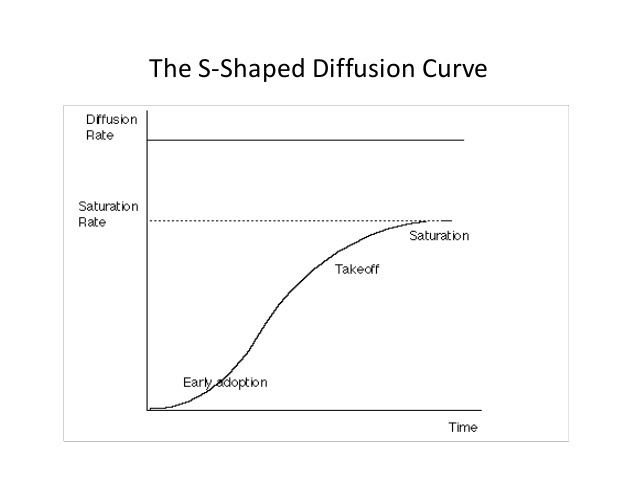 The main argument for postponing "lift off" goes as follows. The Fed has a mandate to stabilize inflation and unemployment around a set of targets: 2% for inflation and (say) 5% for unemployment. We are presently a bit below the inflation target and a bit above the unemployment rate target. IF one believes that raising the policy rate will move inflation downward and unemployment upward, why would one want to do so right now? How can it make sense to undertake an action that is likely to move both inflation and unemployment further away from their targets? Better hold off for now and await incoming data. There is absolutely no sign of inflation either right now or in the future. If anything, market-based measures of expected inflation are falling. The main argument for lift off goes as follows. While inflation and unemployment are presently away from their targets (and not by much), this does not mean that ZIRP is consistent with keeping these variables near their targets in the near and medium term. ZIRP has been helpful in bringing unemployment down, but its trajectory is such that it may very well fall below its "natural" rate. IF one believes in the Phillips curve, then undershooting the unemployment rate target will manifest itself as inflationary pressure. And while inflation is presently low, there are reasons to believe this to be transitory. If it is, and if unemployment continues to fall, the Fed may find itself with inflation running above target. At that point the Fed would have to raise its policy rate much more aggressively than it is contemplating now. Better to raise a modest 25 bp in September (at press conference) rather than wait for December or later (there is no press conference scheduled for the October FOMC meeting). The Fed can keep its policy rate low, or even reverse course as economic conditions dictate. 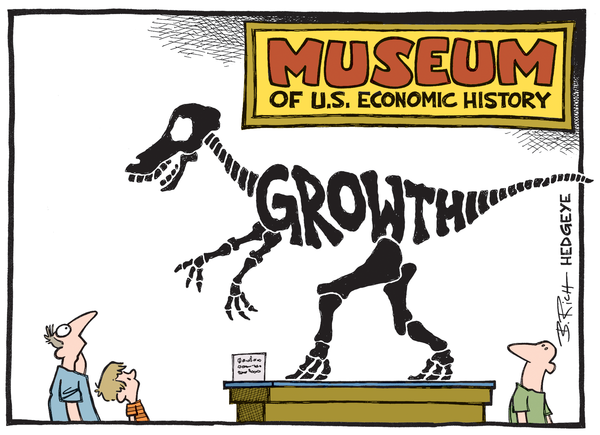 This is still a very easy monetary policy. And it is not unreasonable for the Fed to act in a manner that prevents it from falling "behind the curve" (as it has arguably done in the past). Of course, both of these views are predicated on essentially the same theoretical (essentially New Keynesian) framework. If you don't buy into this framework (for what it's worth, I do not), you're likely to have a different set of policy recommendations. Feel free to propose yours below! 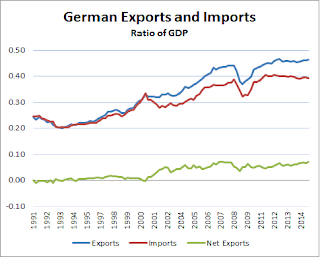 Is Germany's Trade Surplus a Problem? 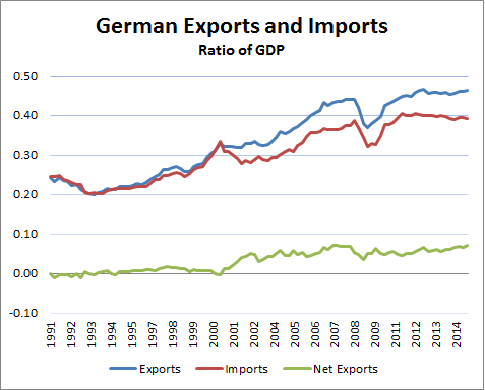 Ben Bernanke's recent post "Germany's Trade Surplus is a Problem" got me thinking about "global imbalances" again. I'm still not sure what to make of the issue. May as well think out loud. The word "global imbalance" sounds ominous. What does it refer to? Let's start by thinking "locally," as in an economy consisting of you and me. Suppose we both work producing a good that each of us desire. From my perspective, any goods you ship to me are "imports." From your perspective, the goods shipped to me constitute "exports." If you export more than you import--so that your net exports are positive--you are running a trade surplus and I am running a corresponding trade deficit. This is the definition of "imbalanced" trade. There is the question of how goods are paid for and how any imbalance is financed. Suppose we live in a common currency area. One possibility is that is that we pay for our shipments fully with money. At the end of the day, your trade surplus implies that you acquired more money from me than I acquired from you. 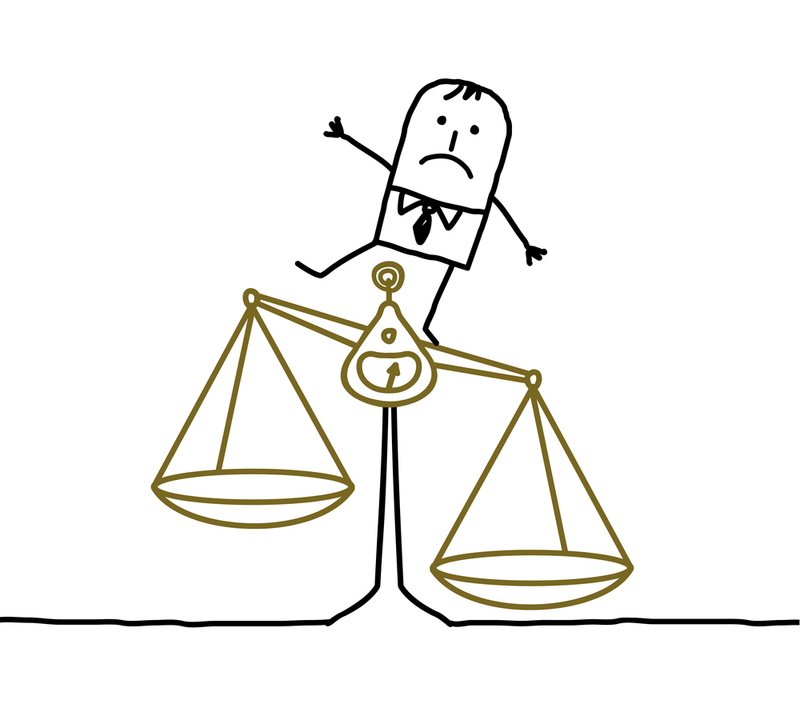 Putting things this way leads us to question the notion of "imbalanced" trade. Sure, I acquired more goods from you--but you acquired more money from me in exchange. It all balances out, doesn't it? Yes, it does. But it's still true that you exported more goods than you imported. And that extra money you acquired...what do you plan to do with it? Sit on it forever? (Actually, I explore this possibility here.) More likely than not, you are planning to spend it one day. When that day comes, I will be induced to sell you more goods than I buy from you. It will then be my turn to run a trade surplus--an act that renders trade "balanced" in the long-run. Nothing fundamental changes in the story above if my trade deficit is instead financed by me paying you with a private or government debt instrument, or by me issuing you a personal IOU. But what if the pattern of trade just described persists? What if you just keep sending me more goods than I send you? Then you are running a persistent trade surplus and I am running a persistent trade deficit. You are acquiring more money and securities, while I am depleting my money and possibly issuing debt. 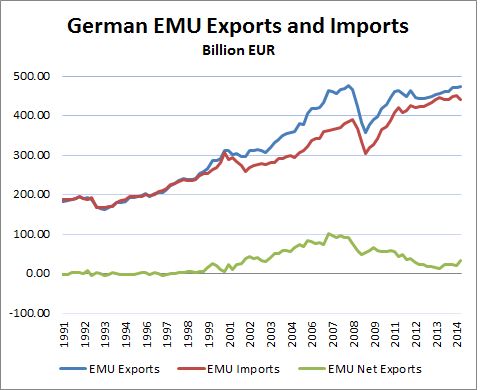 So what is the problem with Germany's trade surplus? Let's say you're Germany and I'm a country in the periphery--e.g., one of the so-called PIGS. Both you and I are wobbled by the 2008 financial crisis, but me (a debtor) relatively more so than you (a creditor). Suppose, for example, my growth prospects are suddenly diminished--I'm looking more like the mature slower-growth you lately. Since our growth prospects are now more aligned, there's not much of a rationale for you to run trade surpluses and for me to run trade deficits--at least, not with each other. What this means is that you should no longer work so hard to make goods for my market. And because I now borrow fewer goods from you, I'll have to work a little harder myself to make up the difference. Except that you go and spoil everything by wanting to remain super busy. So you continue to work hard to export goods to me. And because my market is flooded with your goods, there is no real opportunity (or maybe even desire) for me to work harder--it's tough to compete with you. Your trade surplus translates into a lack of demand in the periphery. Why don't you use your surplus to build yourself a bridge, or something? That'll be good for you and it'll be good for me. That's the Bernanke point of view in a nutshell. I don't think it's entirely wrong, but I do have a problem with the story. Recall where I wrote "there's not much of a rationale for you to run trade surpluses and for me to run trade deficits, at least not with each other?" Well, that's pretty much what happened--with some delay and to an approximation--between Germany and the rest of the EMU. 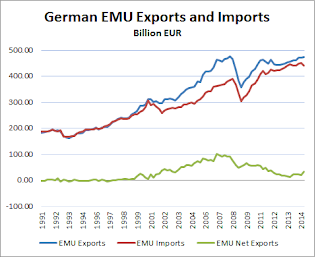 That is, while Germany continued to run trade surpluses in the post 2008 period, these surpluses were not made at the "expense" of other EMU countries--see the following figure. I'm more inclined these days not to view trade imbalances as intrinsically desirable or undesirable in of themselves. If they are associated with a problem, I think they're more likely symptomatic than causal. 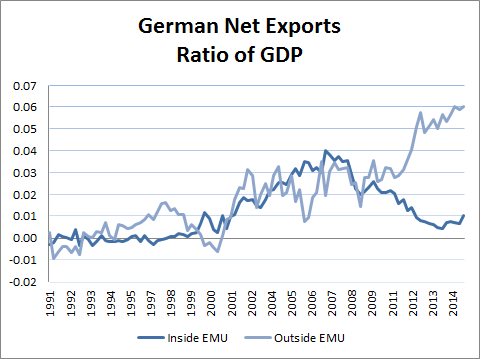 To me, it makes sense that a mature economy like Germany should help finance growth in emerging economies. And should economic weakness in the periphery lead to trade becoming more balanced, this is no reason to cheer. 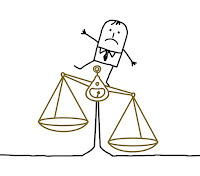 After all, balanced trade is also an outcome associated with financial autarky. Adopting this view does not preclude recommending some of the policies that Bernanke advocates. If the present low yields on safe assets like U.S. treasury debt and the German bund are the byproduct of malfunctioning financial markets leading to a "safe-asset shortage," then a wide class of theories suggest the potential benefits of a debt-financed expansionary fiscal policy (e.g., see here) and not necessarily because such policies stimulate "aggregate demand" (e.g., see here). Whether additions to the public debt are used to finance public infrastructure spending, purchases of private securities, tax cuts, or something else, is something policymakers must weigh. But these decisions are likely not as important as just "getting the debt out there." The added supply is needed to prevent the seemingly insatiable private demand for the product from driving yields to zero (and lower). As the evidence suggests, in very low yield environments, excess demand for government debt is deflationary. 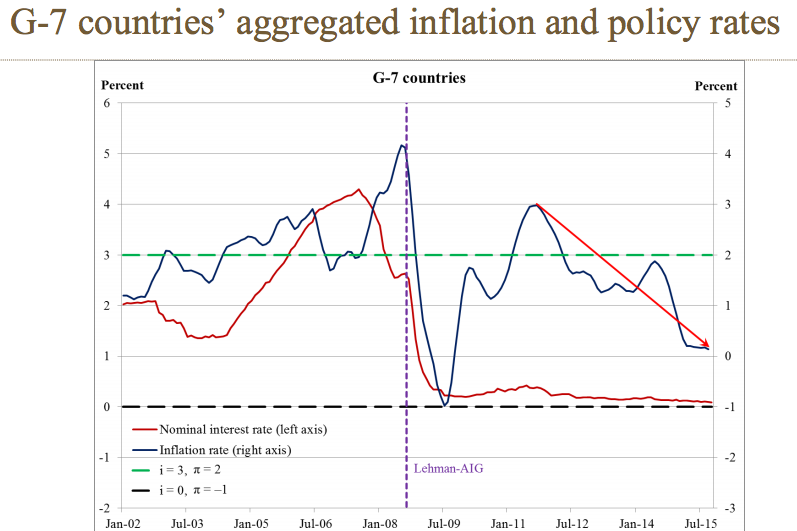 And unexpectedly low inflation is not the tonic that economic theory prescribes for indebted countries struggling to recover from a severe recession. PS. 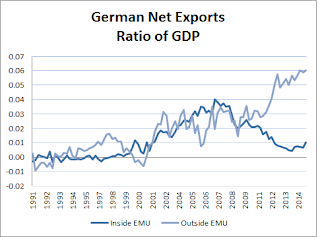 Bernanke also suggests Germany's trade surplus would have been lower if Germany had its own currency, which would presumably now be stronger than the euro against other currencies. 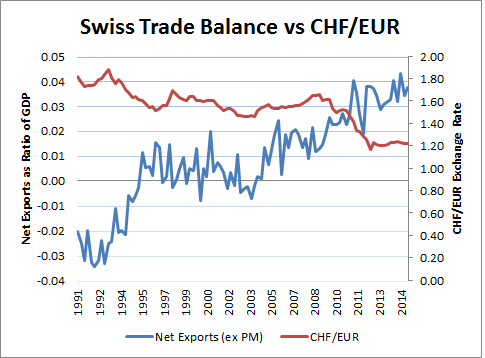 But take a look at Switzerland, where the trade balance has grown in the face of a first stable, then strengthening, Swiss franc.